Ready to improve your eyeliner game? You’ve got to diversify! From kajal to felt tips and beyond, there's an amazing variety of eyeliners out there. Whether you're going for a smoky eye, cat eye, mod style, or natural look, you need to know how to find the right tools for the job. Even if you already have your go-to favourite eyeliners, it's important to know how to use each one to get the best results. For a quick and easy lowdown on every type of eyeliner, here's your ultimate guide. Ready to become an eyeliner queen? Check out this quick and easy guide to eyeliner types. Your first eyeliner experience was likely with a wooden liner pencil. Pencils are cheap, easy to use, and ultra-blendable. Although you can layer pencil eyeliners, you can’t get a jet-black or super-straight look. Annoyed with always having to sharpen your eyeliner? A mechanical eyeliner crayon is used similarly to a wooden pencil. However, the former's self-sharpening tip makes lines a bit darker and more defined, so it’s quite versatile. Want a dark, matte look? Marker-like felt-tip liners are easy to use and give you smooth lines. Love a bold and bright look? Gel eyeliner is perfect for getting vivid colour or a crisp black style. Whilst gel can be a bit trickier to apply since you need a brush, the intense pigments give you a vibrant line. If you're rocking a pro level of eyeliner application, you're ready for cake eyeliner. Used in the same way as watercolours, cake liner just needs a brush and a dab of water to create a beautiful and intense look. Whether you go for a brush tip or a precision tip, you can create a wide range of looks with liquid eyeliner. It isn’t very forgiving to mistakes, but deftly applied liquid liner gives you a dark, long-lasting look. Some of the oldest eyeliners in the world, kohl and kajal have been around for thousands of years in various forms. Designed for use on your waterline, these products are perfect for a smouldering look. As a bonus, they're great for smudging to create a subtle, smoky definition. How do you put on eyeliner? There are many different types of eyeliner that can be applied in a variety of different ways. It is all about finding the best product and eyelining technique for your eye shape and for the look you want to achieve. 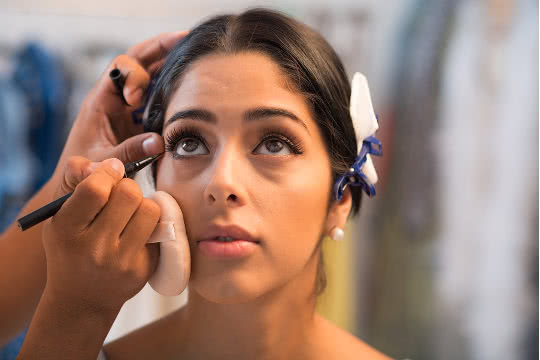 One of the most popular ways to use this makeup product is to apply a single line of eyeliner along the lash line, which can be done with a liquid or pencil eyeliner. 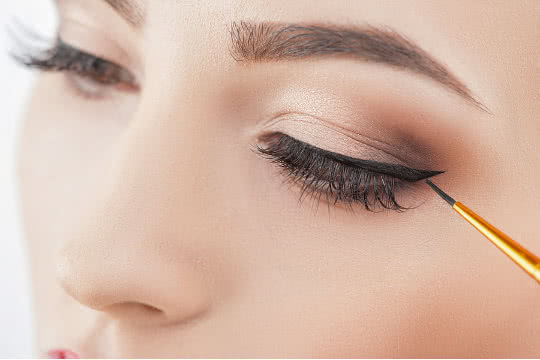 You can also choose to wing out the eyeliner, but this is a more advanced technique and should be based upon the size and shape of your eye. A great long lasting product is The Balm Schwing Liquid Eyeliner. This eyeliner is smudge proof, dries quickly and has a hypoallergenic formula so can even be used by those with sensitive eyes. Eyeliner can also be worn in your waterline for a more sultry and smokey look. A good product for this is a kohl pencil such as the Laura Mercier Kohl Eye Pencil. This eyeliner will glide easily across the lash line for a long lasting, defined look. What's the Best Way to Remove Eyeliner Quickly?